The Cottage will be having a 4th of July weekend sale including 30% off all fabric! I will sign your pre-purchased copies of the book as well. Stop and visit with me if you are in the area. My family and I made an unplanned trip to Iowa this past weekend. this weekend was the only option to go for a visit. During the visit, I stopped at the local quilt store called the Cotton Cabin. I found a few fat quarters of Marcus Brother's fabric to add to my civil war stash. It was a good visit to the shop and the owner suggested I travel up the highway to Dyersville. You know the home of the "Field of Dreams" and the catch phrase "It's not heaven it's Iowa" . Here's the store fron of Vintage Threads. It turns out that Vintage Threads was chosen as one of the top 10 quilt shops and will be featured in the Fall 2011 Quilt Sampler magazine! I was excited to visit a top 10 shop and was able to see their quilt that will be featured in the magazine. I didn't take pictures inside as I got the impression that wouldn't be a good idea with the magazine thing this fall. Some of my fabric loot: good ole red, white and blue. With these prints I taught my mom how to make yo-yo's with a Clover yo-yo maker. She's going to make a yo-yo flag and these prints were perfect. Over all its a nice shop with wool, primitive and dark colors. So if you are in the area of Northeast Iowa...check out the Cotton Cabin and Vintage Threads you shouldn't be disappointed. At first it freaked us out that we had an orange tentacle growing in our mulch....but once we figured it out..we calmed down and removed it. If you don't remove them they begin to smell like a dead carcass apparently. Thank goodness it's gone. Have you ever had one of these? The title is no small title is it? It's a tale of where do I begin. Some where along the line I have gotten a glimpse here, a tweet there about Vignette by LeAnne Beasley. I didn't know exactly what the magazine promised but it looked good on the front cover and many quilters were buying. Did they know something I didn't? So I made a mental note that the next 'shop' I saw advertise the Vignette would be where I'd buy it. That way I wouldn't forget to buy it or later wished I had. Sharon of Daisy Cottage Quilting did just that. She posted about having Issue 3 available and I was ready. and stitchery and quilting patterns. That brings me to the Vignette Hexagon Quilt. At first I thought it was pretty...then I paged through the magazine again and thought some more. I had to make this quilt. Well My version of this quilt. I dug through a bag of hexagons of no particular purpose and began to plan. I gathered orphan jelly roll strips and charms for the flowers as well. I broke out my GO! fabric cutter and off I went. I cut hexagons for about an hour. I have no idea how many I cut. I should count....no I'll quilt instead. My DD that's 4...she did some of the cutting with the GO! as well. It excites her to help me sew. I need a special project bag for these hexies. So I paged through the Fresh Fabric Treats book and found the sewing kit by Kim Walus. Then I started to gather the ingrediants. Where do I get vinyl for the bag? I didn't have vinyl but I DID have the packaging of a sheet set. So I cut the vinyl as best as possible and the one piece actually had a pocket fused to it. I think it held the information card for the sheets at one time. It's hard to get a good picture of the bag. I used Terrain by Kate Spain, recycled vinyl and a thift store zipper PLUS I have a pocket. I am very happy how this bag turned out. The instructions were clear and correct. The only problem I had was with the vinyl shifting or slipping between my fabric sandwich. I ended up basting the vinyl to one strip with 1/8" seam AND then sewing all 3 pieces together with a 1/4" seam. It worked out perfectly well. You can see how I put the hexagon paper pieces in the pocket. My game plan is to work on this while I am laid up during my next surgery. Yes, you read that correctly....I am having surgery #2 already. 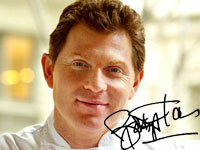 So it will be hexies and the Food Network!! Head over to Kathy's blog to see. She has listed ALL of the blog winners there. AND leave a comment for the Grand Prize giveaway. Does Cosmo thread count in my stash? I bought this happy bundle of 16 to go with the stitchery project in Vignette magazine. I realize that this is Father's Day weekend however, it is getting awefully close to the 4th of July. I pulled out a couple of my tutorials featuring 4th of July theme and made them into pdf's for printing. 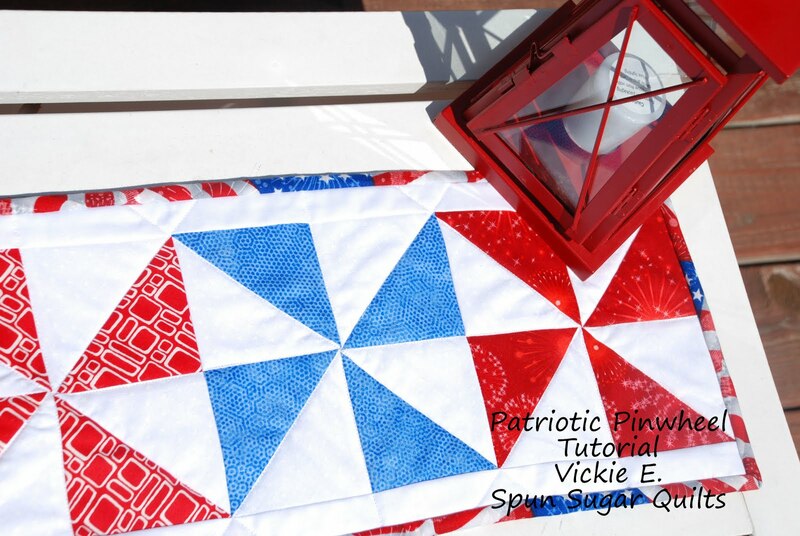 Patriotic Pinwheel Runner is available HERE on patternspot.com for free. 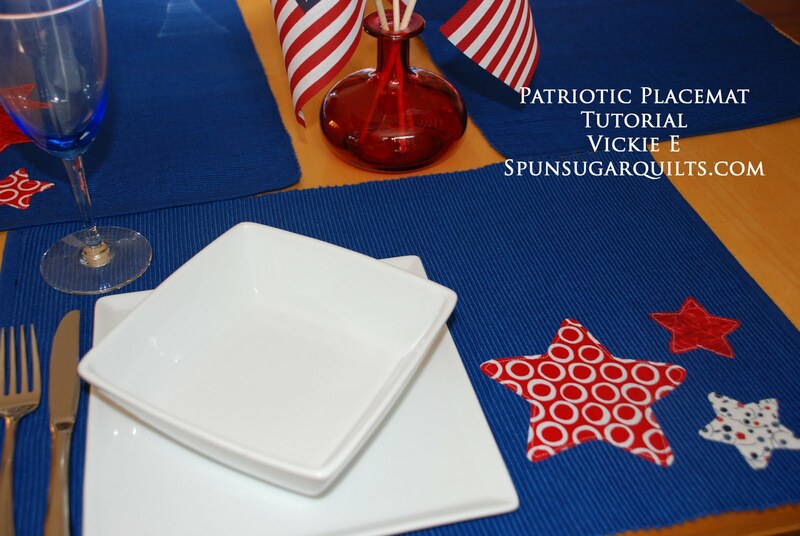 The Patriotic star placemats are HERE. In addition, I finished up my 'cheater' flag pillow. It's a panel from Marcus Brothers I believe. Since it's a 'cheater' of sorts I took the opportunity to try something that I have never attempted before. I stuffed this pillow with scraps. This gives the pillow a firmer feel, and frankly it reminds me of the type of pillow my grandma had on her front porch swing. It could sit outside in the elements and she didn't mind. And this is a little corner of red, white and blue including a pincushion I made from Pine Mountain patterns. I hope you will find some inspiration to create a project for the 4th. My review of the Strip-Smart Quilts by Kathy Brown of The Teacher's Pet. Let me just say that this a must have for jelly roll or pre-cut quilters. Again that's the cool part. 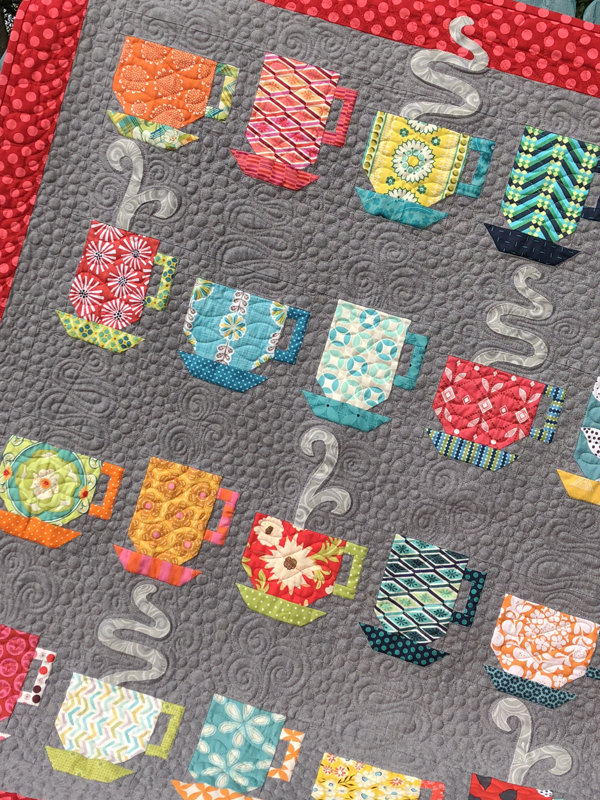 You can use your stash and make an adorable quilt. It is likely that you have already read on the other tour blogs about how the Creative Grids Ruler works. however I just suggest you get the book. The directions are clear and the pictures are very clear as well. I chose the Merry-Go-Round quilt for my 'test' quilt. 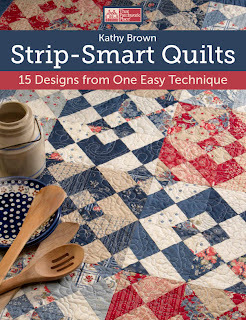 As a quilter, I like to see a book pattern done a different way, your own twist. Merry-Go-Round in Hoo's in the Forrest by Doohikey Designs and Riley Blake. I used 16 2.5" strips from a Roley Poley, found HERE and HERE. Here is an up close picture of the seams of this quilt. But I didn't pre-trim my blocks or trim off the 'ears' of the triangles. It was pretty remarkable to me. Here is my Merry-Go-Round quilt top. With the 16 strips instead of the number in the book pattern my quilt is a 48"X48" sqaure. I don't plan on using a border because I like it as is. ruler in your stash just leave a comment. Kathy will be choosing a winner!! Make sure that you do not miss the rest of the tour participants. Each of these gals provide a great review of the book. Tomorrow's blog is Camille of Thimbleblossoms and she's sure to dazzle us. June 10 - Pam Vieirra McGinnis - PamKitty Morning! June 17 - Vickie Eapen - Spun Sugar Quilts Me !!! 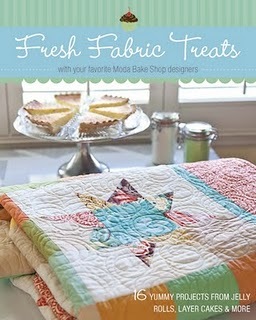 I will be signing Fresh Fabric Treats books at Quilter's Cottage in Garden City, SC on July 2 from 11am-12:30pm. 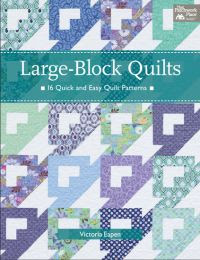 I will be bringing my quilt from the book, a new project that I have started from FFT book and a few other Moda Bakeshop projects that I have made. The Quilter's Cottage will be having a sale the same day 30% off ALL fabric to 'sweeten' the deal. 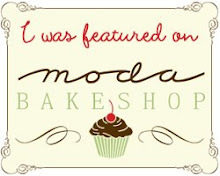 For the confirmed list of book signings check the Moda Bakeshop site HERE. If you are going to be vacationing in the Myrtle Beach area or live near this area in South Carolina please stop by as I'd love to meet you. I am sure you recall my elongated tumbler quilt. Better known as "Hello Yellow" done in Botany. The original magazine pattern is out of print. I decided to make the pattern available AND in 6 sizes! My first pack of patterns on it's way to a quilt shop! I hope to have a few more of my patterns ready for patternspot by this weekend. I have even started ANOTHER elongated tumbler quilt with Riley Blake's new Christmas line Holly Jolly by My Minds Eye. 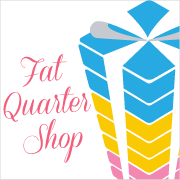 Using a fat quarter bundle I can make a twin size quilt!. Since it's for Christmas, though, I am going to make couch size. I am really loving this line with the greys. I hadn't planned on using grey in my Christmas decor until I saw this fabric bundle. 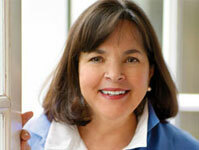 I am addicted to the Food Network. totally hooked me with her style. 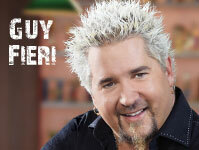 And now I am watching the Food Network Star Competition. 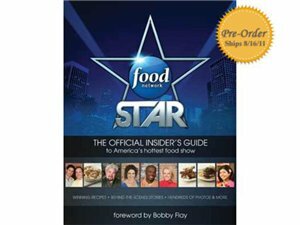 And now I think I need this insider's guide?? wha wha what? no I really don't. I need to get back to quilting.